Oh, hi there. Welcome to Part 2 of Melisa’s Excellent Adventure. What? You didn’t read Part 1? Well, slow down Mister. You’ve got to do that first. Click here. 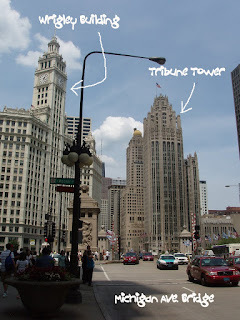 After the CAF River Cruise, I headed across the Michigan Avenue bridge to the Tribune Tower. I was on my way to the McCormick Tribune Freedom Museum. As I approached the building, I saw something that caught my eye. The outside walls of the building were dotted with elements of different shapes and colors. Now, I have passed this building countless times on countless trips downtown over the years and never noticed this. Upon closer inspection, I discovered that these elements are pieces of historical buildings and other structures that they cut the building stone for and then cement into place (after a 10-year wait, I read in the brochure, to make sure their historical credibility holds up)! This was so exciting to see! After that thrilling find (and about 20 minutes and 25 photos later), I headed in to the Freedom Museum. By the way, if you’re a local, you’ll be interested in knowing that admission is free at this museum EVERY DAY (how often does that happen?) until November 9. As you would expect of a museum sponsored by a newspaper and called the “Freedom Museum”, this was a great place to learn about the First Amendment and Freedom of Speech, as well as the other freedoms we take for granted. It’s a small museum that had many interactive exhibits, and I found it very informative. I was able to see everything in about an hour. If you’d like to read it, you can click on the photo to enlarge it. It starts with “How do you define indecency on the air?” I wonder if Janet (Ms. Jackson if you’re Nasty) knows that there is a museum exhibit about her breast. By the way, a shout-out to the late George Carlin, who is also featured in that exhibit (see him, to the right of Justin?) for his “Seven Dirty Words” routine. Are you kidding me??? The Billy Goat Tavern??? I have been wanting to go there for YEARS, and here it was, presented to me like a Hanukkah gift. So, to the Billy Goat I went! I found the next two videos on Youtube. (What did we ever do before Youtube?) The first one shows you how the tavern is below Michigan Avenue. By the way, the Double Cheezeborger was fabulous! After lunch, it was time to go back upstairs to Michigan Avenue and head south, to Part 3! Click here! Joe loves to go to the Billy Goat when he’s down town. Everytime he comes home I have to listen to the SNL skit…lol! Awesome pics in both posts!!! Nice burn, tho – OW! That is so cool! I had no idea that SNL skit was taken after a real place! I have never been to Chicago, I’m so tickled when you give us the “heads up” on the local spots! Oh wow! I must put Chicago higher up on my list of destinations. That woman spitting water is fabulous. Actually all of it is fabulous.